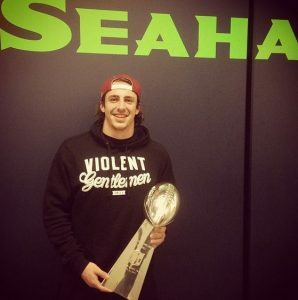 Seattle Seahawks tight end Luke Willson has recently signed an endorsement deal with CenturyLink and he couldn’t be more thrilled about combining forces with the company. Not only that, but the Seahawks play on a field that shares a name with the brand, so it will hit a little more home with him than most people. The NFL star will work with the company to promote their business as well as some of their side programs such as the CenturyLink High School Athlete of the Week which will kick off in September. The LaSalle, Ontario native was a football star during his high school years and was picked three times to be a part of their all-conference. He ended up attending Rice University from 2009 through 2012 and entered the 2013 NFL Draft where he was picked in the 5th round as the 158th overall pick. The Super Bowl Champion has had a great first three years in the professional league and fans look forward to see what he will do next as the Seahawks evolve over the next coming years. Willson just signed an endorsement deal with CenturyLink, the same brand that represents his home field in Seattle. Be sure to keep an eye out for him over the next few weeks in the company’s ads and social media posts! If your company is interested in finding out availability and booking fees for a professional football player like Luke Willson or other sports celebrities for an Product Promotion, Fundraiser Event, Guest Appearance, or Football Camp, call us at 1-888-246-7141.